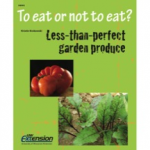 Insects and disease can affect fruits and vegetables in the garden. Most damage poses no health risk. This series of fact sheets help answer the question: Is it safe to eat? (2014; 24 pages). You can view, download, or order this publication on the Learning Store.